Papers, Please was one of indie gaming's biggest hits of 2013, and I am still emotionally stunted from the time I spent denying starving people sanctuary in one of the last habitable places on Earth. With that said, creator Lucas Pope wants me to take my pain with me on the go by making a PS Vita version, but he finds himself at a bit of a crossroads on how to approach the port, says VG247. Up until now, I've been the only guy who's ever touched the source code or anything related to the game. And that's just kind of a control issue. Pope hasn't even had the game translated and localized into other languages yet, unable to let anyone else put their hands on his creation. "A lot of people offered to just, 'send me over the assets and codes and I'll kick out all your localised versions, you'll be set,'" he adds. "But I wanted to do it myself because it was a little bit fun and because I'm a control freak." Currently, he isn't leaning in any direction on the mobile port, stuck with two conflicting sides of his brain that won't cede any ground. For a Vita version, I'm 50 percent I want to do it myself and 50 percent I should just hand, it off to somebody who knows what they're doing and can take it over for me. VG247 also reports that he is taking a break from Papers, Please for a while, besides routine PC report, and he wants to make a free game before pushing on to iPad and the decisions with the Vita port and localizations. 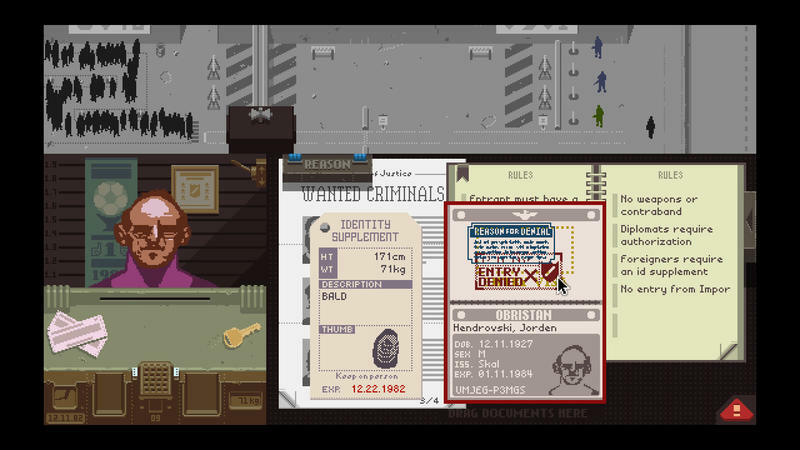 Anybody still looking for another run through of Papers, Please?